I have had brittle nails along with vertical lines on the nails for many years, long before aging. In looking this up just now, I realize I could have hypothyroidism. I have at least 5 of the listed symptoms: fatigue, high cholesterol, brittle nails, forgetfulness, weight gain. I will now insist that my doctor do blood work to detect if I do, in fact, have hypothyroidism. I'm tired of always being tired. Hypothyroidism has been with me for 25 plus years and has masked itself being called depression more than once. 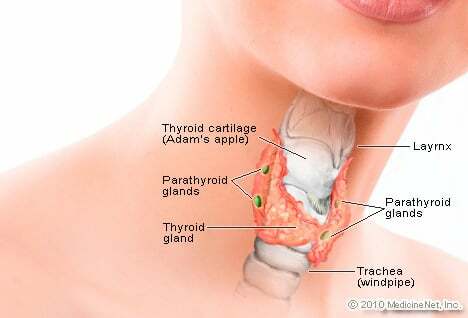 I have had parathyroid growth involvement and removal of the growth on one gland, monthly excessive bleeding problems. Now I have possible adrenal involvement. It took me going to three doctors to finally get one of these to order an ultrasound for me because of my previous experience with the parathyroid growth, diagnosed by ultrasound. After over a year suffering with aches, pains, brain fog, depression due to the para and thyroid malfunction, swelling in legs, feet, hands, and joints, I have still not found a satisfactory doctor who seems to be well educated in the illness of thyroid problems. It is terrible to have to beg a doctor to do their job! Thank you for your listening ear and your ability to help someone who has felt there was no one who cared enough to even listen to the factual story. I have been suffering from hypothyroidism for the last 18 years. When I first had the symptoms I used to wake up in the morning after a good night's sleep and couldn't do the cleaning, I had to go back to bed. I went back and forth to the doctor for a whole 3 months and he used to tell me that I had depression but I didn't want to take any anti-depressants, I knew I had something else. Then one day I heard on the radio a doctor explaining the symptoms of hypothyroidism and went straight to my doctor to have some blood tests. When the tests revealed what I had I was relieved! I felt I was born again; with just a small tablet I gained my strength again and still am strong. I never gained weight, I prepare healthy cooked meals and exercise frequently. I am on levothyroxine and take 100 mg every day. I am 73 years old and I have had the symptoms of hypothyroidism all my life. At age 21 I was told that I have narcolepsy. So I have taken dextroamphetamine since. In my sixties I developed high blood pressure and was put on a medication for that. One doctor suggested that I had hypothyroidism and put on the artificial stuff to no avail. I tried the natural stuff to no avail. I looked at my tests and they all said I was normal in my THS reading so I stopped taking the stuff. All of my medical team seem to think that my thyroid is normal. I disagree. My feet are numb and cold and tinselly. My hair is thinning. I am constantly dieting to lose weight. I can't sleep at night. My sleep habits are two hours and that's it. I am experiencing symptoms of hypothyroidism. I am only 24! It runs on both sides of my family. My dad is on medication for it, my aunt on dad's side, and grandparents on both side have it. I am exhausted all the time, and my body puffs up at night. I eat all the right foods and go the gym and am still 20 pounds overweight. I am often just a bloated, puffy mess - can't even get my rings off! I have a lousy immune system, had to receive gamma globulin infusions in grade school and junior high. I was diagnosed with chronic fatigue. I suffer from panic/anxiety disorder which I think would indicate hyperthyroidism... I don't think I have ever had my thyroid function checked! My first cousin has thyroid cancer at 40. Aren't I just too young! My TSH is at 6 and 181 IU/mL, I think I might have hypothyroidism. I have hypothyroidism and am losing weight. I used to weigh 128 pounds and in about 6 months I lost 23 pounds I am 105 pounds now. I wonder if that is normal or if there is something else causing the weight loss. I have been suffering from muscular and joint pains for the last 5 to 6 years. The peripheral veins started swelling with blockages here and there giving pain in legs. I could not walk because of pain. Hair fell. I could not raise my hands. My collar and back were paining. I was feeling always sleepy due to fatigue. As a result, I lost concentration. I suspect that the decay of almost all my teeth is due to hypothyroidism. Another symptom was dysentery. Altogether, the hypothyroidism rendered me in an unfit mood always with no interest for anything. I never gained weight no matter what I ate. I was envied by friends who were dieting. About five years ago I started gaining weight. I could diet (went through many) and would lose but immediately gain it back. After research, I asked my doctor to run the hypothyroid test to rule it out and then find me a diet to lose the extra pounds. The test was positive and I was told that when the medication was adjusted for me, I'd be able to lose weight, no problem! Right! So now I've been on medication for four years, am still overweight, still trying to lose it, still asking doctors for help in losing it with only the response 'Let's test your thyroid again.' I've researched diets for those with this problem but different things help different people and so far I've not found one that helps me. I have been trying to lose weight for the past 11 years. I have gone so extreme as to only eat grapefruit and water for 3 weeks and gained 5 pounds. My hair has been thinning for the past year. I can sleep for 10 hours and wake up exhausted. I have a constant cough. I have had the lab tests done four times and all say I am within normal limits for the thyroid. I am at my wit's end. Now my doctor wants me to do a 24 hour iodine uptake test. All I want is to stop feeling awful and nearing normal limits. Years and years of being tired finally caught up with me. Anemia was ruled out. It started to frighten me. I would sleep almost 6 to 8 hours a night, be up for about four hours and want a nap badly. Then when I did get a nap, I would be out for 3 to 4 hours. Then up for about four hours and by that time it was bed time all over again. I also have high cholesterol. About three weeks before my diagnosis I noticed foods tasted off and my smells were off too (I knew I wasn"t sick). My primary doctor ran a TSH blood test. It came back showing I have hypothyroidism. I was thrilled. I wasn"t crazy, there really was something off. I have been on the medicine for a couple weeks now. I feel amazing. I can sleep for 6 hours at night and go all day without a nap! I haven"t been able to lose weight for almost two years. I went to my doctor's office and told her that I think I have hypothyroidism but the nurse said I probably don't. I have all the symptoms and I am still getting a blood test done on Tuesday for it. I worked out every day for about six months last year. I spent three hours at the gym each day and I would walk two miles after work and I could not lose any weight so I am hoping that this is the reason why and I can get on some type of medication to lose weight. I have been diagnosed with a mass on my thyroid for about 4 years. I've been to a number of different doctors and heard anything from it's your calorie intake (which is about 1000 a day) to it's in my head; till I found the specialist I have been seeing for about 3 years. She diagnosed that I have hypothyroidism but none of the symptoms except for the mass. So I changed my diet and exercise 4 to 6 times a week. Plus the mass changes size from year to year. It's extremely frustrating that I'm maintaining my current weight and don't lose anything but 2 pounds. I'm an 18 years, since I was little I've been having constant cold feet and hands. it drives me crazy still to this day. I can't seem to get them warm, it's that intense. Also a very painful muscle ache happens randomly in my calves. Not long ago I was going bald in one spot of my head. All these symptoms don't make sense but it's getting me concerned. I don't think of it as something serious, but from what I have been researching all these symptoms fall under the condition hypothyroidism. Yes, after much studying and researching and trying natural remedies for my various symptoms over the years, I suggested to the last 2 or three doctors that maybe it could be my thyroid. Until, I met a wonderful physician's assistant this month, none of them tested me for it. She did and now we are dealing with the culprit of having a 74 reading with a massive hypothyroid issue. The only reason that the blood tests didn't show it previously is because I did not have health insurance until now and the physician's assistant explained to me that the previous doctors would have needed to specify an added test to the normal blood tests requested. I'm so glad, that someone finally listened! I actually found out I had hypothyroidism when I was 18. I was always feeling tired. I had shortness of breath and ended up going to the hospital. The doctors requested an ultrasound and they figured out I had hypothyroidism. Until now I'm taking levothyroxine. I'm still struggling with losing weight. But my doctor says I'm in shape. I'm trying to find natural ways to treat it. I gave birth to my 3rd child three years ago. Recently I had mood swings and weight increases. I was diagnosed with hypothyroid. Doctor gave me 25mg of Euthyrox for a month and 50mg for the following month. I did some research that Euthyrox will cause cancer in the long run. Hence I decided not to start with Euthyrox. I am taking stem cell tablet now. Let"s see what the results are in 2 months' time. I'm always hoarse and my neck and shoulders also feel tight. I'm assuming my condition has gotten bad and I have been ignoring these symptoms because my tests were normal, but this has gotten out of control. I jogged every day for 2 weeks straight and didn't lose a pound. Starting at the age of thirteen, I used to have random uncontrollable black-outs. When I would have black-outs, my heart palpitation would be abnormally fast, I would get really dizzy and lightheaded, everything would turn black slowly, and I'd fall to the ground. My doctors didn't know what was going on until they did tests on my blood and they found that I have hypothyroidism. It explains so much, considering if that I don't take my dosage of levothyroxine sodium, I wouldn't be able to finish off the day because of the lack of energy. --IMPORTANT-- If you think you have this condition, contact your doctor to get a blood test done. A lot of the symptoms are similar to other conditions, so most doctors mistake this condition as another. i have sudden attacks of vertigo and involuntary shaking of hands and excessive unsound sleep. In high school, I was diagnosed with hypothyroidism and was put on Synthroid. I went to a specialist and was able to be active in sports and have energy. After college and moving around the country, I stopped taking the Synthroid because other doctors said my thyroid was working fine, but I can tell there has been a noticeable decrease in my energy level. I have severe fatigue, which has impacted my job status. I am looking to get new blood tests and get back on some type of medication very soon. I'm a 55-year-old bank employee. I was very active and was going for regular walks and doing yoga. I am also a BP patient on a 25-mg dosage. A month ago my face became swollen and I had bags under my eyes. It was difficult to climb steps and I was very tired and sleepy. A blood test said my TSH level was 86.5. Doctors suggested I take 25 mg for the first week, 50 mg for the second, and the third and fourth week take 75 mg. After that, I will need another blood test. It makes me fully depressed and tired. But I have to accept this and hope for the best. In spite of the medicine, I suddenly feel very tired.